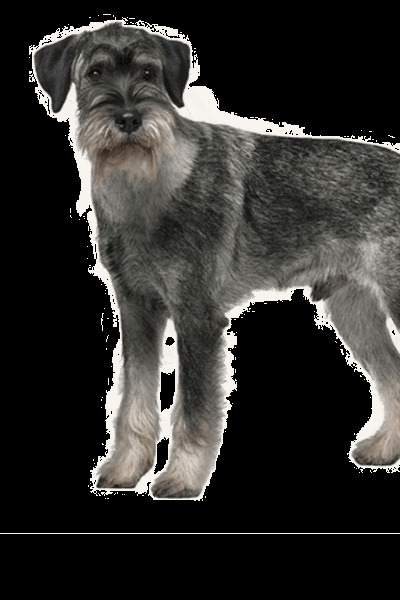 The Standard Schnauzer or Schnauzer is the original size of the three Schnauzer breeds (Miniature Schnauzer and Giant Schnauzer). Bred as a versatile farm dog, the Schnauzer is utilised to control vermin. It is popular for its long beard and bushy eyebrows. The Standard Schnauzer is a smart, playful and clownish dog that thrives on human interaction. It has an average lifespan of 12-14 years. Are you excited to take home a Standard Schnauzer? Here is a brief background of this charming, lively and loyal dog under the Utility group. The Standard is the oldest of the three Schnauzer breeds – the original. The breed originated in Germany during the 15th century as depicted in the artwork of Albrecht Durer dating back in 1492. The Schnauzers were all-around dogs developed to guard property and livestock, and control vermin like rats. They also protect merchants travelling to and from the marketplace. It is believed that the Standard Schnauzer descended from the grey Wolfspitz and the black German Poodle. The crossing of these two dog breeds resulted into the well-known pepper and salt and black coats we see in the modern Schnauzers today. Schnauzers were first shown in the 1870s wherein a breed standard was written. The word Schnauzer came from a German word, “schnauze” meaning muzzle. In 1907, the Bavarian Schnauzer Club was established in Munich, which helped catapult its popularity. The Standard Schnauzer also became widely popular in the United States in the early 20th century. Today, the Schnauzer is among the most sought-after dog breeds because of their adorable looks and kind, loving and loyal nature. Standard Schnauzers are medium in size, weighing 30 to 50 pounds and standing 44 to 50 centimetres at the withers. They are solid and squarely built dogs, characterised by the distinctive beard, arched and bushy eyebrows. It has a rectangular head, strong and blunt muzzle. They have an intense expression in their small, deep-set eyes give them a grumpy look. The ears, set high on the skull are either cropped or uncropped (when uncropped, it’s small and V-shaped). The Standard Schnauzer sports a double coat made up of a dense, soft undercoat and a wiry, rough topcoat. The coat comes in colours of pure black or pepper and salt. Grooming-wise, it is a low maintenance dog breed. Most believed its coat is hypoallergenic because they don’t shed much, which means they are good pets for people who suffer from allergies. However, there is no scientific proof backing that claim. Regular dog grooming is essential, including brushing, bathing, haircut, nail trim and ear cleaning. Most owners hire a professional groomer to trim its coat every six to eight weeks. Make sure you choose an excellent groomer expert in both handling and styling, especially if a Schnauzer is for the show ring. The rest is basic grooming such as keeping the ears clean and dry to prevent infection, brushing the teeth for overall oral health, and trimming the nails to avoid painful overgrowth. Standard Schnauzers are considered easy going, so they make good companions and family dog. 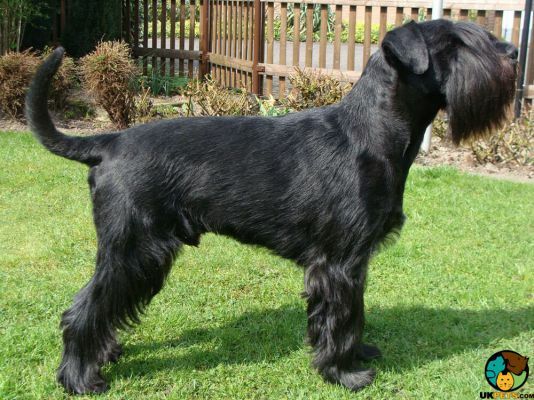 They have fairly strong guardian instincts, so if you want a dog that is alert to potential burglars, but you do not like giant dogs, then a Standard Schnauzer is a perfect fit. It is wary of strangers but would never show any aggressive behaviour, unless provoked. The Schnauzer is bred to be a natural watchdog and guard dog because of its protective nature. It is intelligent, but a bit stubborn (quick to pick up bad habits) and as such early socialisation and training is crucial, so they know what is expected of them and where they are in the pack. However, Schnauzers are amenable to training since they are the types of dogs that relish being given a job to do and learning new things. The Standard Schnauzer is great around children because they are gentle and calm. However, any interaction with small children should be well supervised to avoid accidents, in case playtime becomes a little boisterous. Schnauzers get on well with other dogs and other household pets when raised together in the same household. But they will not hesitate to chase off other cats they encounter since they will think of them as fair game. With that said, care should be taken when the Schnauzer is around smaller animals. Make sure to select dog food that is rich in protein. Protein such as beef, fish, eggs and poultry helps to build and maintain the dog’s muscle, organs, bones and immune system. Whereas, good fats such as chicken fat, lamb fat and fats coming from sunflower oil are sources of calories in a dog’s diet that provide it with the energy. Many ailments and health disorders are hereditary, meaning they are associated with the dog’s breed. So if you want to take care of your Schnauzer, you must know the health concerns specific to its breed to determine preventive health measures and hopefully avoid some probable risks. Consult with your veterinarian if you notice any unusual signs or symptoms. 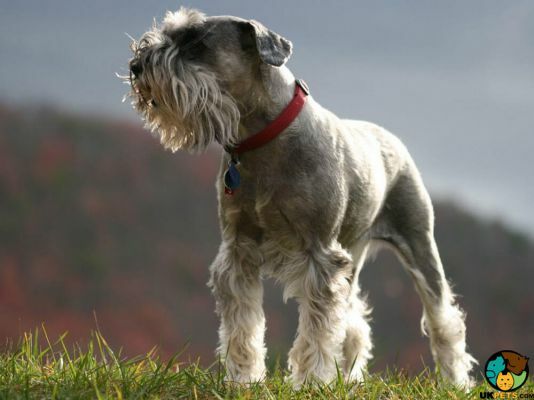 Here are the common issues seen in Standard Schnauzers to give you an idea of what may arise in the future: Hip Dysplasia, Pulmonic Stenosis, Nephroliths, Skin allergies, Schnauzer Comedone Syndrome, Adenoma and fatty tumours. The Schnauzer has a high level of energy which means they will require plenty of daily exercises. Since they are also intelligent, they also need to be given enough mental stimulation to be happy and well-adjusted dogs. Schnauzers should be given at least 60 minutes of exercise daily, with as much off the lead time as possible. Do this, if you don’t want them to pick up negative behaviours just to let off steam. It is vital to be aware of basic pet expenses before you buy a Standard Schnauzer puppy since the cost to care for this dog breed, or any dog breed for that matter goes beyond dog food. Put simply, make sure you can afford to provide for its needs over its lifespan. When you purchase a Standard Schnauzer, expect to spend £300 to £500, especially from a reputable dog breeder. Another costs often overlooked is pet insurance. When you avail of pet insurance, it will cover part of the vet expenses in the future. So get affordable pet insurance with good coverage. It usually costs around £23 to £42 a month to insure a 3-year old Schnauzer, provided the dog does not have any prior medical history. As expected, you will have to spend £30 to £40 for dog food, while veterinary care can quickly rise to £900 a year inclusive of veterinary visits, vaccinations, annual boosters, even neutering or spaying. 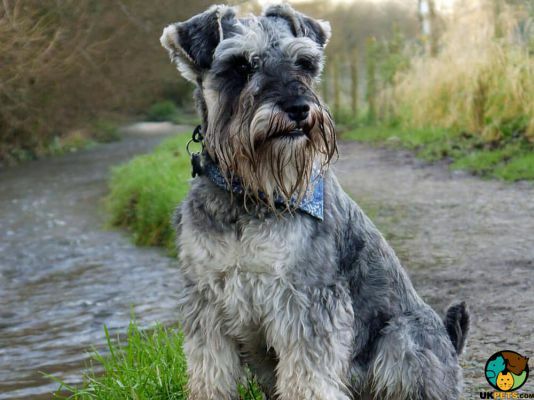 Overall, set aside a monthly budget of £60 to £90, depending on the type of insurance you avail for your Schnauzer and whether you will want to enrol the dog to an obedience school. 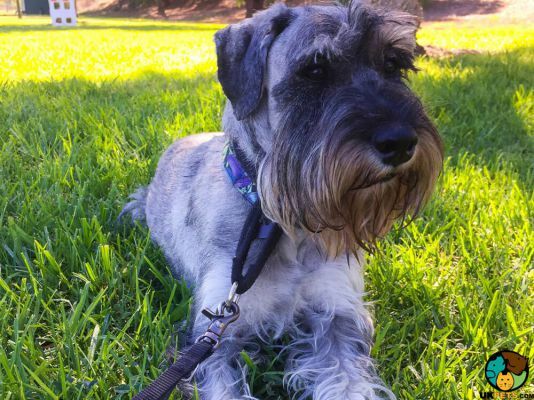 Is a Schnauzer Right for You? The Standard Schnauzer is the original size of the three Schnauzer breeds. It is a smart, playful and clownish dog that thrives on human interaction. Grooming-wise, it is low maintenance, often considered hypoallergenic. Schnauzers are natural watchdogs and guard dogs because of their protective nature. They have an average lifespan of 12-14 years.